And that’s part of the problem isn’t it? If you’re part of a society that happens to have available many of the things you happen to enjoy it’s hard to understand how not having those choices available to you would affect you. Interestingly, Waldfogel touches on some of that issue as well. Studies that connect levels of civic engagement with respects to how closely tailored local media is to particular ethnic groups grew from studies of how ethnic groups tend to use non-local media (cable television, the internet) as their primary news source when local media isn’t tailored (i.e. isn’t relevant) to them. First—and this should be no surprise—classical music consumption is heavily influenced by electronic technologies and media. Audiences have shifted, and will very likely continue to shift, their discretionary time and dollars toward new technologies for listening to classical music. Second and contrary to the critics, younger generations of Americans do seem to be “growing into” a more mature interest in classical music, but they will probably, much more so than their parents, satisfy that interest outside the concert hall. The audience in the symphony concert hall may be aging, in relative terms, but the overall audience for classical music is not. A survey released in 2008 indicated a steep decline in audience participation in the performing arts. But it turns out the data paints quite a different picture when analyzed differently — when the definition of “participation” is expanded to include more than simply buying a ticket to something. The 2008 survey told us that only some 35% of adults attended a performance or visited a museum; but the new survey pulls the lens back and realizes that 75% of adults interacted with art in some form via their computers. And classical music is leading the way: 18% of that audience participated in classical music, more than any other kind of art. Setting aside the relevancy issue, I’ve been seeing as a trend towards the emergence and growth of non-Western Orchestras in the US (and North America). Going back to Waldfogel’s basic thesis that “given high fixed costs, those who are members of a preference minority are far less likely to get products they desire” what I think we’re seeing is just a reflection of the growing economic influence of ethnic groups. With the changing demographics of the US and a growing non-Euro-American population, that just means a bigger pool of resources in general to get past the high fixed costs of starting (and maintaining) a large ensemble. But what reason do ethnic minorities have to make the large ensembles they support simply be the Western Classical ones we think of when we think of Orchestras? We can argue till we’re blue in the face about the need to preserve the high art of Western Classical Music–but how many of those advocates will argue the need to preserve the high art of non-Western Classical Music? And no, I’m not saying that only European-American will support European Styled Orchestras and that Arab-Americans will only support Arabic Orchestras and et cetera with other ethnic grous. There’s obviously going to be overlap of folks from any group interested in the art musics of any culture. It would be a ridiculously essentialist characterization of ethnic populations to make the claim they would only be interested in art musics from their countries of origin. 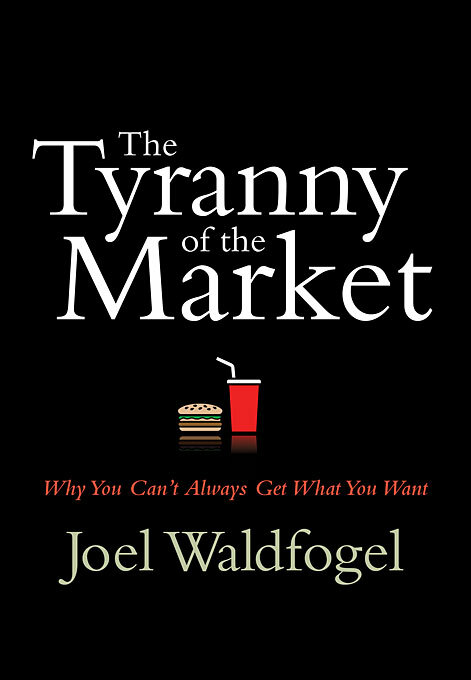 Despite claims to the contrary, however, we’re never completely free of our cultural backgrounds and that will shape to some extent what and how we support anything with our dollar voting, and as Waldfogel argues that can sometimes lead to a Tyranny of the Market. Thanks, Elysia–would love to hear your thoughts. My wife is finishing her MBA so I’ve had many discussion about these issues with her and have gotten some inside scoop on how the discipline is being taught. I actually came to a lot of the economics research through the back door, so to speak–I mentioned that for a while I was seriously considering going into some fiel related to comparative neurocognition. While spending time studying the field I started to come across tons of research related to behavior and politics/economics. It’s still a relatively “new” field, Behavioral Economics and Political Psychology, but both fields have helped us to understand how human behavior isn’t so “rational” as the post-enlightenment Europe would have us believe. And now with the rise of so-called indigenous psychology, cross-cultural psychology, and other comparative fields in the cognitive sciences, we’re starting to understand how different groups behave and in some cases how they behave differently given the same experimental conditions–and how predictable that behavior is once we know the cultural background or history of individuals in the populations being studied. I think we’re finally in a good position to stop thinking about human behavior as a narrowly defined universal given–which means that any economics that treats humans as universal rational subjects with exactly similar psychological conditions regarding behavior is an idealization at best, and prescriptive drivel at worst. One of the reasons I hated studying economics as an undergrad was because it was universally acknowledged that people don’t behave rationally but the professors always made us ignore it and assume people did behave rationally. They spent a lot of time telling us how the models we were studying didn’t reflect real life at all and that people didn’t really behave in these ways, but that it was “too hard” to study the models that worked, particularly as undergrads. They did the same thing with regards to failed models that screwed up various African countries. “We know this didn’t work when we applied it and the country, which is still messed up, but it’s a good model to know and no, we aren’t going to study why it failed and what we didn’t take into account and what should have been done differently.” It was an extremely aggravating subject of study and I was constantly being told I was wrong for pointing out the flaws. That being said, I haven’t had much time to think about economics and music (just woke up and haven’t had coffee!) but certainly that what’s happening with the demise of the western symphony reminds me greatly of what I had to study in my econ classes: the people in charge assume that people think/act in a certain way (usually the way they want them to) and then make all their decisions based on that. Then they wonder then why things fail. So, the other thing I was thinking about before sleeping last night is the essence of what economics is: the study of incentives. It’s not about math or statistics or any of these things that people think it is (the hard economics.) It’s about incentives. What motivates people to be have in certain ways. It’s sort of like psychology, but less neurotic. The hard part of econ, that economists don’t like talking about, is being able to correctly identify and take into account all the incentives for all the players in any given economic situation. If you miss just one incentive for anyone involved, the model becomes inaccurate. And if you domanage to figure out every single incentive, it’s incredibly difficult to model these things. I spent large amounts of time pointing out to professors/TAs/other students that vast amounts of variables and incentives were never taken into account which turned me into a bit of a laughing stock, but oh well. Now back to music, the part that is sort of the least thought-out. What someone needs to do (and I have not done) is to figure out every single incentive people have for going to see various kinds of performances. Figure out what’s helping, what’s getting in the way. Then how to manipulate incentives to make things work differently. The best example of this that I’ve ever studied is microcredit. The incentive that makes it work is that when groups of women (most of the loans are to women) do something financial as a group, they keep each other in check and are less likely to bail when things get tough. They don’t give up as easily because they have five other women pressuring them not to. It’s a social incentive drawing on the way that people interact with each other in a very specific social groups applied to loans. The results were brilliant. I feel like I’m articulating this horribly, coffeeless me here, but hopefully the point will make sense. What non-music incentives can be applied to the current situation to make people behave differently (ie. how we want them to?) This is, of course, after figuring out what incentives already exist because this artificially constructed incentive (ie. like the loan groups) will interact with the incentives currently in place and if the current incentives outweigh the artificial one, nothing will change. I hope that makes more sense to you than it does to me currently. I’m off to go make myself some coffee and hopefully when I re-read what I wrote it makes some minimal amount of sense. We barely know why people do things or rather, we’ve taken this old model of human behavior and assumed it is correct and never really questioned it even when we have evidence to the contrary. In a way, economics (or at least “Classical economics”) isn’t a whole lot different than the institution of Classical Music–both are stuck in old 19th century ideas and concepts. I forget who it was that lauded economics for attempting to be more like the hard sciences, especially physics in its modeling attempts but that it was too bad that the model used was the old Classical Mechanics and that Physics has advanced so much more in the 20th century with Quantum Mechanics, Relativity Theory and Chaos Theory. I’ve been following developmental economics research lately, since that school of thought actually looks at how developing nations (even the US and Britain) have evolved their economic models over time and that at the beginning of all the actual successful countries (including the US and Britain), there was invariably heavy amounts of protectionism and tariffs quite contrary to the free trade that Anglo countries are attempt to force other countries into adopting (which, as you noted, usually failed for those countries that did adopt it–especially in Africa and some South American countries). Ha-Joon Chang calls it the “Kicking Away the Ladder” syndrome and has written much about the subject. That’s interesting about the microcredit idea–I haven’t come across that yet, but am definitely going to look into it! So much of how we behave depends on the immediate peer groups we associate with as well as familial and cultural background, it just seems ridiculous to talk about the black/white of “Free Trade” (which is never really free when it works as it should anyway). OMG YOU HAVEN’T HEARD ABOUT MICROCREDIT BEFORE??? Seriously??? Muhammad Yunis won the 2006 Nobel Peace Prize for it! Here’s a wiki article to get you started on him: http://en.wikipedia.org/wiki/Muhammad_Yunus There was also Banco Sol which if I remember correctly spanned multiple countries in South America, although I’m not sure if it’s still around. Memory is a bit fuzzy. Back before then, lets see, maybe in 2004 I think, I actually took a two course series on developing nations which was almost entirely about microcredit. They were my two absolute favorite classes I ever took for my major. They were both taught by TAs instead of professors, both of whom didn’t buy into the standard econ BS and talked about the reality of how classical models fail and why microcredit was so brilliant. Our discussions were almost entirely about incentives, especially when we talked about failed economic policies that Westerners applied to various African countries. So often major things, such as half the population having HIV or that the government was corrupt, were ignored as factors in the economic models. It was absolutely bizarre how stupid these top economic officials could be. It really drilled home how important incentives are. Economists like to pretend they’re scientists, but talking about what motivates people goes against that, so many refuse to do it. And now, how do we relate all this back to music and make it useful? Thanks for the link–will definitely look into that. As for how this relates to music–that’s something I’ve been exploring for ages now and what got me on the underserved audiences idea. Basically, I look at the arts, even the popular arts as all being subsidized. Since the arguments pro/con about the state of Classical Music are about how pop music is “doing well” as opposed to the dismal state of Classical Music so much of the talk about this (in this country) falls along political lines and often unhelpfully becomes an issue of letting the arts die since it shouldn’t be funded by the government anyway. Yeah, I know it’s a simplistic argument and lacks any sort of sophistication, but it’s out there, and I was thinking about the ways to address this when I starting thinking about how popular art is just as much subsidized–it just happens to be the case that those who are subsidizing it are all members of a “dollar-voting” majority–which in so many cases often translates into members of an ethnic majority. So if the argument was that government support causes economic harm since it re-allocates money from one group to another group it was just a “simple” matter of demonstrating that subsidy (I’ve gotten used to calling this a “Cultural Subsidy”) by a[n ethnic] majority can economically harm a[n ethnic] minority. Waldfogel’s work gave some of the necessary research into how that happens. OK–I decided I probably need to post the rest of this in a blog–I just keep typing and typing, so I’ll leave the first fourth of this response here and see what you think and start a blog post for the rest–hahah!! So, I’m writing this on my iPod, which means you’ll likely get rather disjointed ideas being typed here. I haven’t thought this through very well yet either, but here are my thoughts. I’ve been thinking a lot about education lately in terms of public schooling, particularly with where it went wrong in my own experience. In fourth grade every student at my school had to play recorder and then in fifth grade choose between flute, clarinet, saxophone, or trombone to be in band. It was cool because it was mandatory but there were a lot of problems with the program. The one that I think is significant to the topic at hand is the music we had to play. It was all dated pop music. Usually by several decades. Here was this group of impressionable young kids being exposed to playing music for the first time over a three year period. They were never exposed to western art music nor any non-western art music during this whole time. They were also stuck choosing between only four (western) instruments, which the kids were not happy about (I would have preferred to play oboe instead of clarinet but was not allowed. I spent 2 years in band wishing my clarinet would magically transform into an oboe.) As a result only a couple people kept playing when we went to junior high. I doubt anyone went on to appreciate any kind of art music, despite the education. My point is that these school education programs are often terrible at getting kids interested in the kind of music that we wish that they would spend money on to see as adults. Until I started playing cello I listened to nothing but what I now consider crappy pop music. Okay so maybe somegood older pop music too, but certainly not any kind of art music. Nothing in my background had prepared me to be able to really listen to anything else. I think the ways that our public education system approaches music education isn’t conducive to creating future western and non-western art music consumers. I have a lot more I could say on education but we’ll save that for later. Hope this was at least somewhat interesting/useful. I haven’t forgotten this, Elysia–been a busy couple of days and interestingly I had a pretty heated debate about Arts Funding last night after rehearsal at the pub with some other musicians. I will definitely be coming back to all this issues in full force when I have some time on my hands! Waiting….waiting….waiting…. got a few thoughts about this that probably aren’t helpful, but you never know… will wait for the new post though.